Importing cars to USA borders is a process that you can’t just put on cruise control. It’s even more difficult to get the key to that car and drive it across the USA border to importing victory lane. The importing process comes wrought with emission testing, importing regulations and manufacturer requirements. Take a drive with us as we teach you how to maneuver through the traffic when importing vehicles manufactured in other countries to US borders. What’s the Value of Your Vehicle? What is Your Importing Regular Duty Rate? Get Your Plates and Drive! Importing Cars From Europe: How Much Does it Cost? Which Customs Bond Works for You? Cars are the single most popular purchase for American consumers. They crave cars so much that they demand brands from all over the world. That’s where you come in. Importing cars from Europe, Germany, Japan and more is a big part of that American consumer car demand process. Learn how to navigate US car import law below in the following four ways. The easiest way to achieve customs clearance approval is to find a Licensed Customs Broker to assist you. When importing cars to USA borders, you need to comply with U.S. importing laws and regulations from various agencies. Your car’s parts also need to comply with American standards. For instance, a car that has a speedometer that reads kilometers will have to convert to one that reads miles instead. Other issues include headlight modifications, reflectors, engine and emission modifications and more. When importing a car to the US, if it’s very similar to other models that are already manufactured in America, you can take advantage of the Substantially Similar Clause. 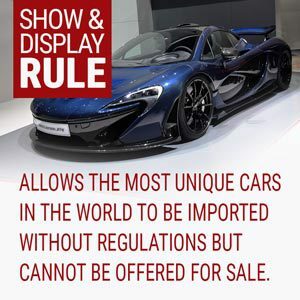 This clause is primarily used when importing cars from Canada. That’s because American and Canadian cars typically have interchangeable parts. If customs agents agree that your import is similar to American models, it receives a green light for importing. Passed in 1999, the law exempts unique vehicles from regulations, including stringent safety regulations. This means these cars don’t need parts replaced. The cars do need to pass Environmental Protection Agency (EPA) rules. Need an easier way to import a car to the US? The day a car reaches its 25th birthday, it’s legally allowed to pass customs clearance in the United States with no restrictions. Happy Birthday older cars! Your present is no inspections whatsoever! There are only two hurdles to the 25 year rule. The state where your import car is going may require modifications for safety items to receive a tag and registration. And in the state of California, older cars mandate stricter emission requirements for all cars manufactured after 1975. There are actually benefits for cars being 21 and 25 years of age. A 21-year-old car does not have EPA requirements for import inspection. A 25-year-old car can legally enter the U.S. without complying with Department of Transportation (DOT) and Federal Motor Vehicle Safety Standards (FMVSS). Nissan Skyline GT-R V-Spec: This car right here. Americans have been salivating to get these cars here easily for decades. While it’s been eligible for importing to the USA for a couple years, this is the first eligible year for the V-Spec model, which offers a limited-slip differential for better handling and beefier brakes. BMW M3 (E36): This is the BMW M3 Americans always wished they could have. It has a 3.0 liter 286-horsepower inline-six engine that will make your heart sing. McLaren F1: Thanks to this birthday, some of the first McLaren F1 models can hit US ports of entry this year with no troubles. Porsche 911 Carrera RS 3.8: Enjoy the bigger and bidder brother of the Porsche 911 Carrera, which boasts a 300-horsepower engine. Good luck with your efforts though because only 55 of them were built. Fiat Coupe: Drive one of the cars in real life that you previously only drove in the video game Gran Turismo. This is a head turner because it’s such a unique coupe. Aston Martin V8 Vantage: Welcome to the land of two European superchargers on a 5.3-liter V8 that produces 550 horsepower. Mazda Lantis: We have to put some regularity on this 2018 importing hot list. The Mazda Lantis stands out for its four door compact capability with a V6 engine that packs a punch. It will be fun to shock the V-8 engines off the line at the stop lights with this little speedster. Lotus Esprit Sport 300: Remember that fancy sports car Richard Gere couldn’t figure out how to drive in the beginning of the “Pretty Woman” movie. Drive the cooler one from Europe if you’re lucky enough to land one of only 64 that were built! Audi S2 Avant: A 2.2-liter turbocharged 5-cylinder engine with an all-wheel drive system. You’re welcome. Subaru Legacy GT: For Dads seeking performance and practability to haul kids and junk, the Subaru Legacy GT should be on their importing cars to USA shortlist. Why are Some Cars Illegal within US Borders? TVR Tuscan: This roadster lacks both airbags and antilock brakes, making it a red flag car for America. Volkswagen Beetle Ultima Edition: In 2004, Volkswagen said goodbye to the last edition of the original Beetle. But you can’t get behind the wheel of one in America. Jaguar XJ22OS: In 1993, Jaguar built six cars known as the fastest on earth. But they can’t race here in America. Lamborghini Strosek Diablo: Headlights and side mirrors that are too small and can never be fixed to meet American safety standards keep this Diablo from entering US ports of entry. Morgan LeMans: This popular British car has never been deemed a safe car for American streets. Lotus Elite Series 1: A cool looking two door coupe with no roof and no windows is a deal breaker for the United States. Nissan Skyline: Don’t worry. As we noted above, many versions of the Nissan Skyline are available in America. But the V-Spec and Gt-T versions built between 1989 and 2001 are built for speed only and are outlawed here. Rover Mini Cooper: The 1995 version of the Rover Mini Cooper is considered a classic but American Mini Copper fans can’t drive it here for safety reasons. Do you ever ask yourself this question? “How do I find out the value of my car?” Whether it’s a personal daily driver or for importing, the value of the car is important when doing your importing cars to USA homework. Try using research tools like Kelley Blue Book Private Party Value to research car prices to come up with a number that works for you. However this price is only accurate between private buyers and sellers. DO your homework with overseas buyers and wholesale distributors to make sure you are not overpaying for your overseas vehicle imports. Emissions standards are the Environmental Protection Agency (EPA) rules and requirements that make sure exhaust pipe pollutants released into the air from cars are meeting acceptable levels. 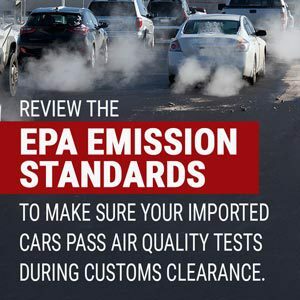 Review the EPA emission standards for all vehicles to make sure your import vehicles pass their air quality tests during customs clearance. Recently, the EPA announced its revoking previous presidential administration emission standards that required vehicles in the United States to meet emission standards that forced cars and light trucks to average more than 5 miles per gallon by 2025. California, meanwhile, has complete control over its own emission standards for new and used cars. Make sure your imported cars can achieve success under California’s separate emission requirement. 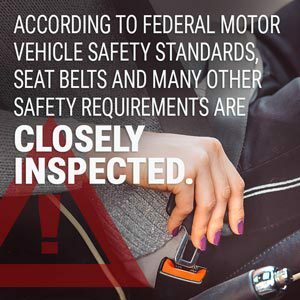 Federal Motor Vehicle Safety Standards (FMVSS) are required for many vehicle imports. The United States mandates that many design, crash and durability requirements be in place to enforce the safety of car drivers. Did you know your car imports must undergo federal emission testing that’s done through laboratory testing? Emissions are always tested while a car is driven in a testing garage using a chassis dynamometer. Vehicles are tested through different driving cycles representing different driving patterns that include a 10.5-mile drive. 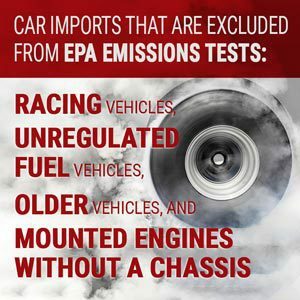 The EPA Form 3520-1 is a declaration form that’s required for the importation of cars and engines. The pollution standards of these cars are subject to federal air pollution requirements. 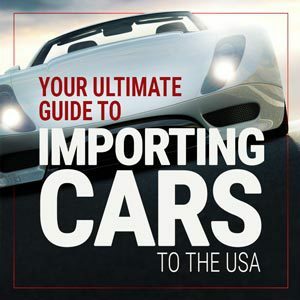 This form is turned into the U.S. Customs and Border Protection (CBP) for all vehicles, kit cars, light duty vehicles, engines and more being imported into the U.S. Remember that this form, though, is not needed for cars and trucks that are imported by their original manufacturer and those that are new and have received an EPA certificate of conformity and EPA emission control label. The HTSUS uses a hierarchical number system of 17,000 individual code numbers to classify imports and impose the correct tax. It provides the most up to date tariff rates and categories for all imports. Classifying your goods is very important so you receive the proper tariff tax. This also allows you to speed through the custom clearance process faster and make more money in the long run. What is a gas guzzler tax? It’s a tax based on a combined city/highway fuel economy in miles per gallon rating that is handed out by the EPA for tax purposes. This EPA rating, though, can differ from other fuel-economy statistics the manufacturer releases. Gas-guzzler fuel ratings may need assigned to car imports that don’t have one.. Lastly, a tax is not needed for import cars with a combined fuel-economy rating that hits at least 22.5 miles per gallon. Japanese cars are very popular in America. They are known by the majority of American consumers as well built and dependable vehicles. They also have high resale values. How much does it cost to import a car from Japan to USA? That all depends on the supplier you choose and the manufacturing cost. Do your homework to make sure you are selecting the best Japanese vehicle that can make you the most profit. Search for your Japanese cars by forging relationships with Japanese manufacturers, auction houses and dealers. Do some research online but make a trip to Japan to meet people face to face and see the cars to make sure you’re comfortable before starting the complex importing process. When you are doing your research, it’s important to remember that your car imports must be in compliance with U.S. laws and regulations. Make sure emission and safety standards are compatible or can easily be modified. Do you want to know if you’ll have an easier time when going through customs with your car imports? It’s as simple as finding a sticker. 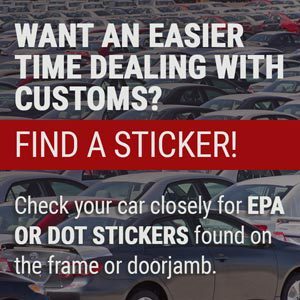 Check your car closely for Environmental Protection Agency (EPA) or Department of Transportation (DOT) stickers on the frame of the vehicles. DOT stickers are typically found in the doorjamb of the driver’s door and EPA stickers can be found near the engine compartment. You will need to get a letter from the certified manufacturer of the vehicle if your car is missing either of these stickers unless the car is 25 years old or more. Find an independent commercial importer (ICI) that can assist you with modifying your Japanese imports if you know the car won’t pass U.S. emissions and safety tests. Remember that it can be costly to make certain a vehicle meets modification requests to pass through customs. EPA Form 3520-1: This EPA form outlines the model, make, status of the vehicle and if there’s an independent commercial importer involved. DOT Form HS-7: This DOT form consists of car information and must show which port of entry your car is arriving at. CBP Form 7501: On this Customs and Border Protection (CBP) form, you need to prove the value of your car. Along with this form, you also need to have proof of ownership in the form of the original title or a certified original copy of the title. It’s always a good idea to have your car cleaned before a customs inspection to remove foreign dirt or anything else from the undercarriage, especially foreign soil. Don’t give customs officials any reason to black flag your car on inspection day. Remember that you have to pick a car carrier shipment company to physically ship your car imports from Japan to the United States. The quicker you can outline your arrival date plan to your vehicle carrier, the quicker you can get your import paperwork process moving. It should take between 10-17 days to move your car from Japan to a US port of entry. Congratulations! If you’re Japanese import car is at your planned port of entry, you have won the customs clearance battle. Don’t celebrate just yet though! You need to arrive on time or have a Licensed Customs Broker on the scene to pick up the car. Remember that you have to pay a duty fee, which is based on that actual price you paid for your Japanese car imports. It amounts to 2.5% for cars and a much heftier 24% on trucks. Returning US residents, though, can use an exemption toward this fee if they have a permanent residence in the United States. Don’t forget Uncle Sam. Remember that your imported Japanese cars are subject to the gas-guzzler tax. If your Japanese import is rated with a less than 22.5 miles per gallon fuel economy rating, you’ll be paying up. You have finally reached the finish line! Now it’s time to register your Japanese import car and receive license plates at the state of your choosing. Take all of your import documents with you in case the state you need a license plate in has some questions. Remember that all states have different requirements so be patient and press on to get that license plate and drive off into the sunset! Are you looking to import engines from Japan? Japanese engines are very popular in America. Many consumers are looking for specific engines they feel can overhaul their car and give it more horsepower and dependability. Follow our rules for importing Japanese engines below. Do you need a Honda engine or a Toyota engine? Is the engine you are looking for compatible in other types of cars? The more versatile the engine is, the more demand there will be for it in the United States. Talk to mechanics and look at automobile message boards to import the engines that Americans crave. Just like a car, make sure the Japanese engine you’re importing is compatible with American regulations and will pass EPA and DOT inspections. Is your engine not compatible with American engines overseas? You can still import it if you fill out Form 3520-21. How does importing a car from Canada to USA borders work? Since we are neighboring countries, you might think it’s a simple process. But it’s not. When you are importing Canadian vehicles, the same customs process ensues even for neighboring countries. Make sure your vehicle identification number (VIN) shows on your Canadian bill of sale document. You also need to acquire the manufacturer’s statement, a vehicle title and the certificate of origin. Always obtain a temporary tag and insurance from the province in Canada where you are purchasing your Canadian import. The good news? Most cars made in Canada you are importing to the U.S. are not subject to duties. However, foreign cars still pay the same duties: 2.5 percent for automobiles and 25% for trucks. How much does it cost to import a car from Europe to the United States? That all hinges on the size of the vehicle you are shipping overseas. Shipping costs alone start at $700 and can cost upwards of $2,000 for larger SUVs and trucks. Think Mercedes Benz, BMW and Maybach for starters. These luxury car brands ensure that importing a car from Germany to USA borders will stay popular for decades to come. Germany is one of the most bustling car manufacturer countries in the world. You should a hire a customs broker with knowledge of importing cars to USA borders from Germany. They make sure your paperwork is very specific to avoid customs clearance delays that cost you money. Before you start importing cars from all over the world, make sure you have an insurance policy in place other than normal car insurance. If a tow strap breaks and a car falls on the boat or if the boat sinks, you need a policy in place that covers each and every car import. Find an insurance policy with far reaching coverage from a company that specializes in shipping companies. 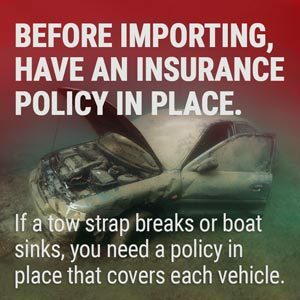 Remember that you also need a separate insurance policy once your car hits the road at the US port of entry. Arrival notices alert you that your goods are ready and waiting for you at your US port of entry. Automobile imports are release from the port once you schedule a time to pick up your imports after you receive your arrival notice. Bill of ladings (BOLs) are distributed by carriers to shipper imports. BOLs are basically insurance for damaged, lost or delayed goods. This important form contains a tracking number to watch your auto imports as they go through the customs process. All of these documents work together to help importers with the information they need to receive customs clearance process success. The three-letter import trading terms used both domestically and abroad for importing are known as Incoterms. These three letters showcase the transaction import details for both buyers and sellers. Licensed brokers use the proper Incoterms for your goods to get your imports cleared through customs quickly. Did you know there are multiple U.S. ports of entry on both coasts that you can utilize to import your cars? When you import cars from USA, find out which east coast port of entry or west coast port of entry is most convenient for you and your customers. When you are importing cars to USA, follow the importing timeline and don’t miss any deadlines. If you are importing cars from manufacturers in other countries, following the importing rules other countries impose is crucial. Find the proper import duty, or tax, for your automobile imports, which require a customs bond. You need to import cars quickly. There an importing value exceeding $2,500, which requires you to purchase a continuous bond. You need to move through the customs clearance approval process with the U.S. Customs and Border Protection (CBP) quickly. There are two customs bond types available for your use. Find the customs bond that fits your business needs for car imports below. A single entry bond is typically used for importers needing to ship a single shipment to a port of entry. These bonds work for sporadic importing with shipments that are low in cost value. We recommend this bond if you import goods less than four times a year. A continuous bond is what you need if you import multiple times throughout the year. Continuous bonds handle everything you need for imports all year long. A US customs continuous bond is crucial for those with multiple importer entries every year. Continuous bonds, which handle high-value shipments, can also be renewed automatically every year so you can keep concentrating on your business. Customs bonds are required for vehicle imports. To receive the proper customs bond to pass through customs clearance with ease, figure out the customs bond type you need today. We also provide cargo insurance through our network of supply chain companies. Let us walk you through purchasing additional insurance that protects you and your imports. Are you still undecided on importing vehicles to USA? Does the importing process worry you? If importing vehicles seems overwhelming, contact AFC International today to allow our Licensed Customs Brokers to handle all of your vehicle importing needs. The qualifications that a Licensed Customs Broker provides make the import process an easy one. Our value-added customs brokerage services work together to provide you with an importing process that allows you to concentrate on your business. Have questions? Click the bottom right box to chat and we can answer you right now! Clear customs easily with us today by requesting a customs bond quote! We are here to serve you! Hi, If I want to import a brand new Peugeot 3008, is it true that I should have it crashed test first? EPA tested for fuel and emission? California test too? Thank you for your questions. We have customs brokers available to answer your questions right away by clicking on the chat button in the bottom right corner of the page. How about importing light (a.k.a. mini) NEW 2018-2019 vehicles from Japan to the States NOT intended for the road? Rather, they will be used for electric car conversion projects. Those Japanese mini cars are all 660cc engine vehicles and the best candidate for electric conversion donor vehicles because they are so small and light; much smaller than the smallest cars sold in US. My plan is to film the whole process and share the entire conversion process via YouTube. They will never be driven on the US roads even after it’s finished, so there won’t be any need to have them licensed. In this specific case, do I still have to go through the usual EPA and DOT requirements for those intended to be driven on the road? Thanks for reaching out with your question. Your case is very specific and we’d like the opportunity to talk to you about your import. We offer consulting services where we are able to walk you through all the info you’ll need including the document requirements, clearing customs and any duties and fees you may be responsible for. We can also handle filing your paperwork with Customs and Border Protection if we determine you’ll need it. While a customs broker and freight forwarder are not the same thing, we can assist with the actual shipping of your your vehicles from Japan into the US if you need help with that, as well. We will email you to follow up and get started.